Urban transformation projects have long been threatening living spaces of Istanbul residents. First slum demolitions, and then 63 million square meters of forests to be pillaged for the third bridge, shopping malls built one after another, luxury hotels, and while the pedestrianization project continued, next was Gezi Park. Istanbul residents continued to resist all of these projects that threatened life. Until excavators came to Gezi Park and uprooted the trees; until ‘a handful of marginals’ that claimed the trees and their shadows and said ‘Do not uproot trees, do not build a shopping mall into Gezi Park.’ This demonstration was introduced as an ‘ecological and peaceful’ action; until the police unleashed an early morning operation and smothered the park area with gas. The State must have ‘a lot’ to profit since they’re trying to bring this peaceful protest down as hard as they can. Police violence was climbing up in the last few months, and protesters were unexpectedly exposed to it. Deputies of opposition parties and artists came to Gezi Park to protest this and to support resisters, but they also had their share of state terror. In the first day of demolition, the State could not get what they wanted because of this situation. Protesters stayed in Gezi Park for the night. It’s unknown if they were expecting an attack the next morning, but all protesters were thrown out of the park during the police raid at dawn. The police burned protesters’ tents, blankets and belongings. The videos of protesters exposed to continuous tear gas bombs and violently taken in custody invoked rage in everyone who watched. Of course, this rage was not a rage for a single demonstration. This rage had been accumulated; accumulated because of the increasing police violence. It was the attacks with gas bombs, batons and firearms that created this rage. It was the forbidden May 1st, the assault on Dilan Alp, and the deaths of Şerzan Krut, Metin Lokumcu, Aydin Erdem… What created this rage were more than a couple of days. It was the ever-increasing oppression, restrictions, censorship, economic exploitation… What created this rage was the State exercising its power on the people recklessly, relentlessly and without questioning legitimacy. Those who ascribe ‘People’s Uprising’ as a form of post-modern action should take clear-eyed look at this fact. People came to the streets spontaneously because they felt the social, political and economic oppression heavily. The events are neither about tackling few days’ issues as the blind-deaf mainstream media say, nor are influenced by ‘marginal’ groups as the heads of state power claim. It is time to raise the curtain thrown over the eyes. This is a revolt. It is the response of people against state terrorism, police violence and capitalist exploitation. This is the end of legitimacy of the new state power that had gained the love of other States, international institutions and global corporations. It is very important that the revolt is happening at a time when the propaganda of state power is the ‘Democratic Turkey.’ By this reaction to state terrorism, people pulled down the ‘democratic’ respectability of the State. People were on the streets in a setting where freedom of the people was ignored, where people were tortured and killed arbitrarily, while all of the mainstream media turned into official state press, and the State is preparing for war in neighboring countries and killing its own people with its own hands while doing this. The revolt spread to other cities in the second day. 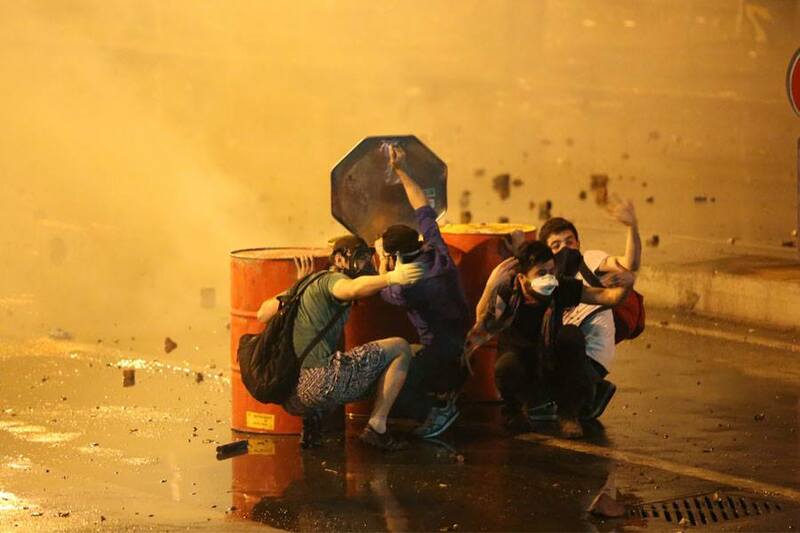 The shared rage against state terrorism started to burn streets everywhere. The public took to the streets not because of the main opposition party or some leaders’ words, but with own volition; to respond to all of this by standing against police violence and state terrorism. With this consciousness, they attacked the police, state buildings and temples of capitalist exploitation. The ones that did all of this were not ‘marginal groups.’ This was also a revolt against the othering behaviour of the State toward those who did not obey its power, against the ‘marginalizing politics’ of the State. Moreover the government did not have anybody to settle or deal with. This revolt was a direct action. The State dismissed the revolt from the beginning. It was banned on television, newspapers and other media. It was not only happening at Taksim. People flowed from Beşiktaş, Harbiye and other districts of Istanbul. The State closed Gezi Park and Taksim Square with all law-enforcement officers in hand. The clashes continued all day. The public got angrier by every gas bomb, every sound bomb and custody. They resisted police violence with determination. Nearly a million people that filled Taksim did not step back; to declare that we are here against the state dismissal and neglect. In the morning of the second day, police violence was even more intense, and we had news of deaths and wounded people. The State terrorized without caring about either legitimacy, or human rights, or democracy. In a two-day revolt, the State threw away all the masks of ideals and values that it had been hiding behind. The State showed its real face to its people. The monopoly of violence terrorized resisters not just in Istanbul, but in every place where actions of solidarity with Istanbul were held. News of deaths, news of wounds and custodies increased. 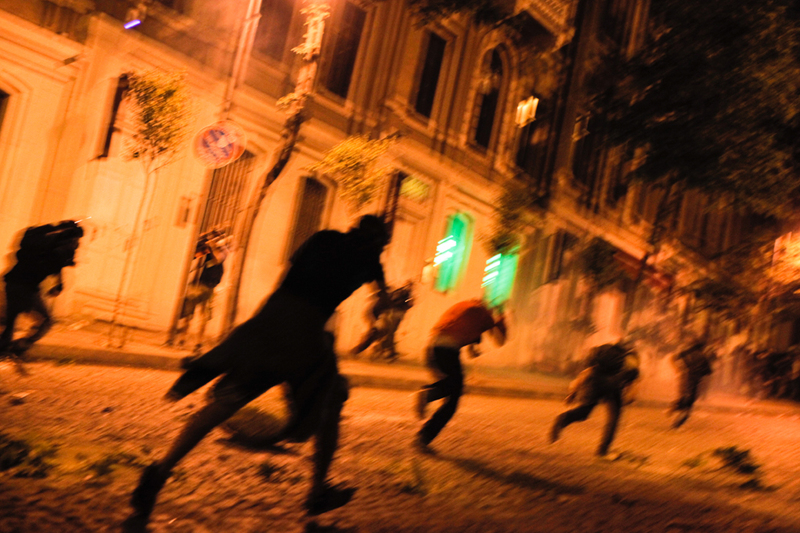 Forty hours in total… After nearly forty hours of clashes, people walked from Istiklal Street to Taksim Square. The law-enforcement officers escaped with all vehicles. 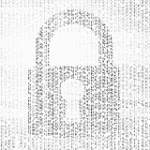 Forty hours became forty years; the square became the world for us. This was the freedom of revolt. Our sorrows were our injured friends and those who had lost their lives. 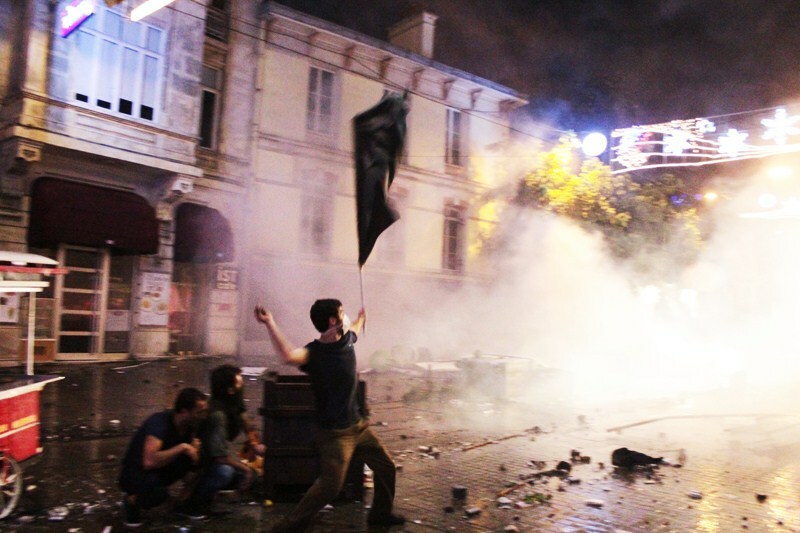 Then Gezi Park, then Gümüşsuyu, then Beşiktaş… And beyond İstanbul came riots in Sakarya, Kocaeli, Ankara, Adana, İzmir… In this revolt, which is still going on, the most important motivation that kept spontaneity alive was sharing and solidarity. Voluntary health workers formed civic medical centres for activists that were affected by police violence. Organizations like law associations, lawyers’ bars, and human rights associations supported protesters in custody or in similar conditions. Trade unions like the Turkish Mechanical Engineers Chambers Association turned their buildings into infirmaries. People opened their homes, workplaces, gave support with food and drinks. People gave information to each other over social networks, and created their own means in face of the silenced media. Everywhere and everyone became the revolt against state terrorism, police violence and all forms of exploitation. Social solidarity has worked, and is continuing to work, wherever the State was dismissed from the lives of people. The media that became ‘mute’ at the beginning of riots, now try to give a meaning to the revolt — of course, the meaning that their bosses want. They said it is individualist, it is reckless, it is post-modern, that it is urban or secular… They have affirmed people that poured into the streets with all these concepts. They likened it to the Velvet Revolution in Prague. They are trying to void a revolt against state terrorism, police violence and capitalist exploitation. Sectors that were disturbed by the party in power and its government because of conflicting economic and political interests (many of which are upper and upper-middle class) started to go out in the streets over the next days. These sectors, that were supporters of the previous state rulers, were emphasizing anti-government protests rather than resistance to state terror and police violence. Care must be taken to avoid strong reformist demands originated from these sectors, in their attempt to block this new struggle of the oppressed against state terrorism, police violence and capitalist exploitation. These sectors may try to manipulate the struggle towards their own economic and political interests. Parties in opposition may try to exit the situation in the most profitable way for them, as with all ‘springs’. Their callout to stay away from ‘marginal groups’, while assessing the revolt, is the clearest evidence that they are talking with the language of Power. As in revolts in other places, these parties that try to gain power by using this rebellion will attempt to stop those who revolted spontaneously, without leaders and without parties. Since these sectors are not the organizers of the movement, they cannot impose their social-economic characteristics to the public. So, they cannot direct the action. Besides, their insistent phrase ‘marginal groups’ consists of the individuals that annoy them, but are also the real mobilizers of the revolt. What’s more, they are consciously blind to the fact that other oppressed people from different sectors are resisting not only in centres like Taksim and Beşiktaş but also in ‘surrounding’ areas. Yes, the revolt has an ideology, but it is not an ideology that the media, the parties in opposition and various economic focus groups try to homogenize and depoliticize. The ideology of the revolt is the consciousness of the individual that feels the increasing state terror, and the individual action to struggle against it. This revolt started against state terror, police violence and capitalist exploitation, as we emphasized from the beginning. We hope that it will increase with general strikes and have more of the oppressed on the streets, and with this hope we are growing the revolt. Our reservations towards the revolt may become reality later on, if the revolt will be diminished into a power struggle of opposing parties. But we are not oracles. Revolutionaries do not make hopeless predictions of the future and sit on the corner. We know well that revolts like this are mobilizing moments on the way to social revolution. Our anarchist fight will thus continue to embrace the revolt with passion. Data from the official report by the Turkish Medical Association as of June 12th, 2013; constant updates here. • It was reported that there were injuries in 13 cities. • 7,478 people in total applied for injuries. • 4 persons are dead (one of them was a police officer). • 55 people have severe injuries. • 91 (severe/broken) head traumas were reported. • 1 person in Ankara, 3 persons in Istanbul, 1 person in Eskişehir, 5 in total are in life critical condition. • 10 persons have lost their eyes. • 1 person’s spleen was removed.